When you like to wear unique style dress shirts in fun fancy patterns. Contempo Suits has your back. 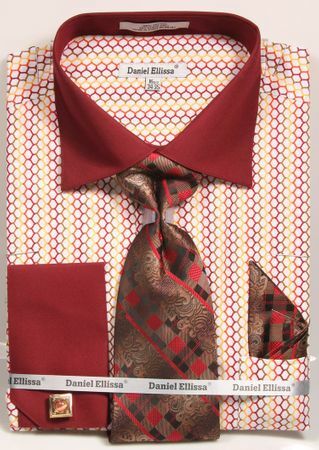 Daniel Ellissa dress shirt and tie sets have the fashion forward flavor you're seeking with their collection of fancy pattern dress shirts that come with the matching tie sets. This burgundy pattern shirt features a link style pattern with solid burgundy collar and cuffs. Made of pure cotton.